Recently, we played some games of Chain of Command from Two Fat Lardies and had great fun. But playing single games without any connection isn’t satisfying. So we decided to give our games more meaning and start a campaign. We bought the At the sharp end campaign handbook and the Kampfgruppe von Luck campaign. I can recommend both books, especially if you consider their price. We used these books as an inspiration and started to build our own campaign. Our campaign will cover the invasion of Normandy. Part I of our campaign will consist of three games, in which the Allies can only field paratroopers and light vehicles. For the first two games, the Germans will also be limited in their support options. This should simulate their surprise. In part II, we will introduce US Army troops and heavy weapons on both sides. We have a wide variety of miniatures available. 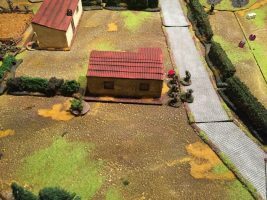 The Germans can field basic Infantry, Panzergrenadiers and Fallschirmjäger. Besides that, they can field two Stugs, one Panzer IV, two Pumas, two SdKfZ 251s, one Kübelwagen, one Flakpanzer IV Wirbelwind and one Marder 3. 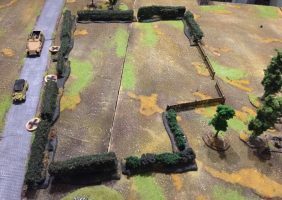 The Americans have two Airborne Platoons and two Infantry Platoons available. Their motor pool is also well stocked: one Jeep, two M3 Halftracks, one M8 Greyhound, one M3 Stuart, one Sherman, and one Hellcat. In the first game, we used the scenario The Probe from the basic rulebook, with some alterations to our setup. 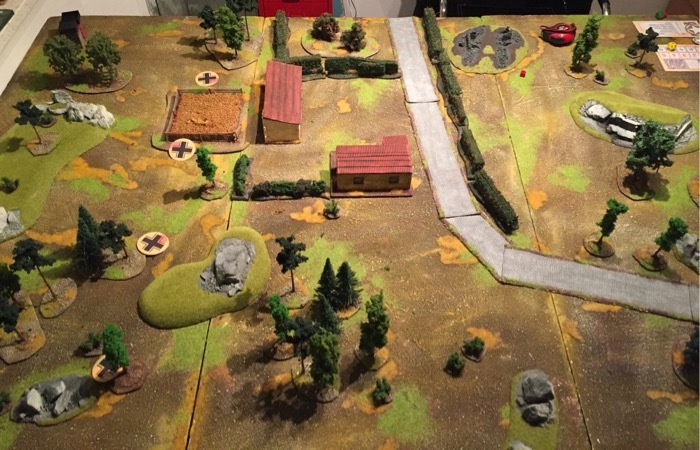 The Germans started the patrol phase on the left table edge, next to the road. The Americans started on the opposing side in open field. 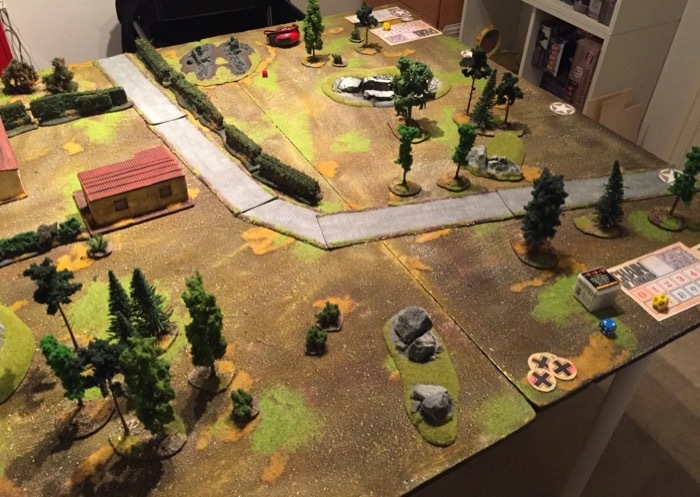 We thought that this setup would be more realistic for our setting. We also considered some kind of confusion on both sides. The Germans were surprised, which could limit their effectiveness in combat. The Americans on the other side were scattered and some even lost. So they too would have to struggle with the circumstances. To represent this on the table, we rolled one D6 for every unit, to determine their status. On a 4+ the unit would be ready for action in round one. Otherwise, the troops are delayed. We repeat this process every turn, to spice things even more up. The patrol phase was pretty straightforward. The jump-off points were quickly established. The Americans started their first round with one squad of paratroopers and a mortar team. For the Germans, the effect was even harder. Only one squad with an LMG team and a senior leader (from the support list) arrived in a Kübelwagen and a SdKfZ 251. The Americans somehow managed to sneak up on the hills and slowly approach the fence. The Germans were still unorganized and unable to fight back with full force. Well, maybe they were still sleepy. And things won’t get any better for the German side. Their reinforcements arrived too late. 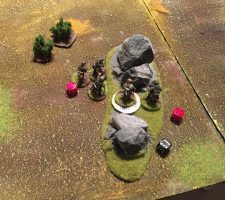 The Screaming Eagles used their chance and took the flank. As a result, the Germans had to retreat. In the second game of our campaign, we played the Attack & Defend scenario. The Germans were the defenders, while the Americans attacked. Again elite troops would fight green troops. An obvious disadvantage for the Germans. Damn you, war in the east! The German side started with one rifleman fewer than normal, due to their losses in the first game. Luckily they got support: a Puma and one MG 42 team join their ranks. The Americans on the other side started in full force, reinforced by one adjutant. So the forces were set and the game could start. 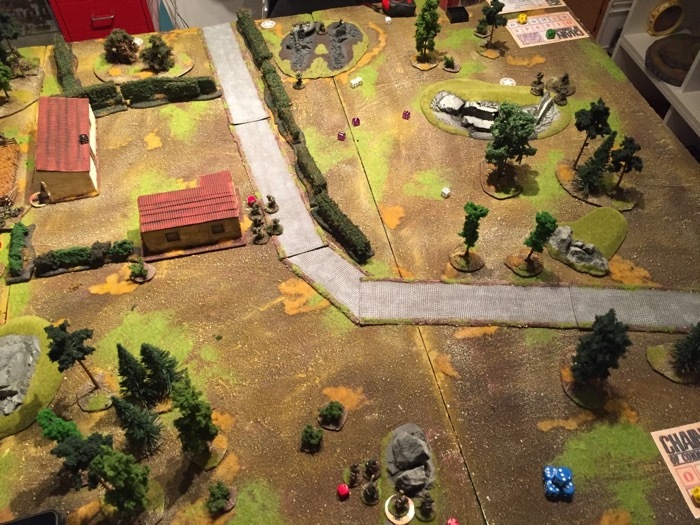 A small farm is in the center of the table, next to the road. We added some trees and boccages. Et voila, your typical French countryside is ready for war. 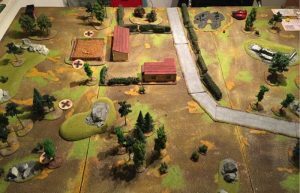 The Germans would enter the battlefield from the left side of the table, the Americans from the right. In the patrol phase, the markers locked in pretty fast in the middle of the table. A heavy fight in the first turns seems to be unavoidable. The Americans set up their positions on the two hills. A slick move. Especially the mortar team would prove useful later. The Germans entered next to the village, occupying one of the farmhouses. From there, they could block any American advances through the boccages. Well, at least that was the plan. 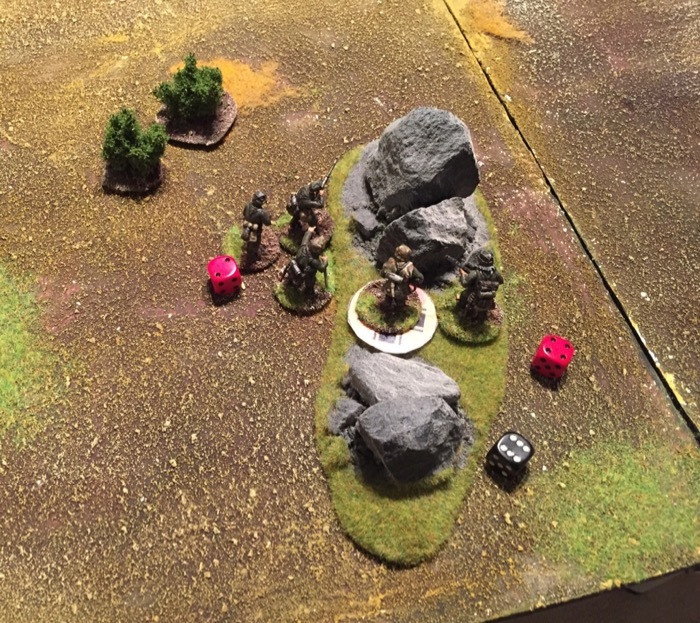 A second German platoon took cover behind some rocks, trying to outflank the American mortar position. As von Moltke once said: no plan survives first contact with the enemy. This popular military wisdom proved itself again. The Americans gained a four round rush, without any German activities at all! 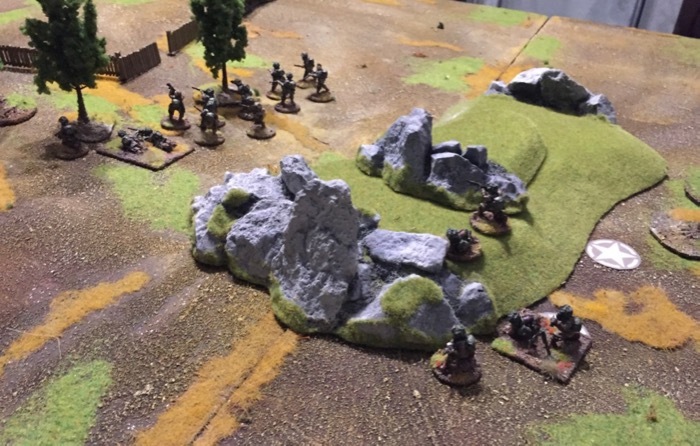 As a result, the mortar and MG-team battered the German platoon behind the rocks. Fighting back desperately, the Germans managed to kill two members of the American MG-team. But, nonetheless, they had to retreat behind the rocks. But this was not the only setback for the Wehrmacht. Meanwhile, an American platoon outflanked the farmhouse. So the Germans inside the farm had to face enemies from both sides. 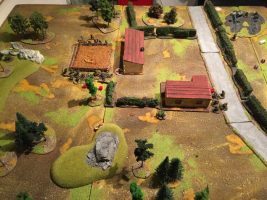 A third German platoon and the MG 42 team entered the battlefield to confront the US Forces behind the farm. The result was a heavy firefight next to the cornfield. The German platoon next to the cornfield took heavy casualties. Pinned down, they were unable to fight back. In the meantime, the second German platoon next to the rock took another mortar shell and broke. The Americans were now pushing for the final fight. 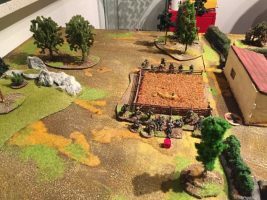 An Airborne platoon rushed through the boccages in front of the farmhouse, trying to outflank the pinned German platoon. The Germans inside the farmhouse used their overwatch, but they couldn’t stop the attack. The Americans next to the cornfield finished their opponents. So another German platoon broke and had to retreat. Obviously, the battle was lost. The German side was in full retreat. The last remaining platoon left the farmhouse on the double. Desperately, they tried to leave the battlefield. At this point, the game ended with a German withdrawal. The second game was very one-sided. The US side gained four rounds, without any German intervention. The Germans drew heavy casualties in these rounds, unable to recover from this blow for the rest of the game. The battle was already lost, so some units like the Puma never entered the table. Bringing them on the table simply wouldn’t make any sense anymore. As a result, a retreat was the only option for the German forces. Luckily, the casualties in this battle won’t have a huge effect on the next game. 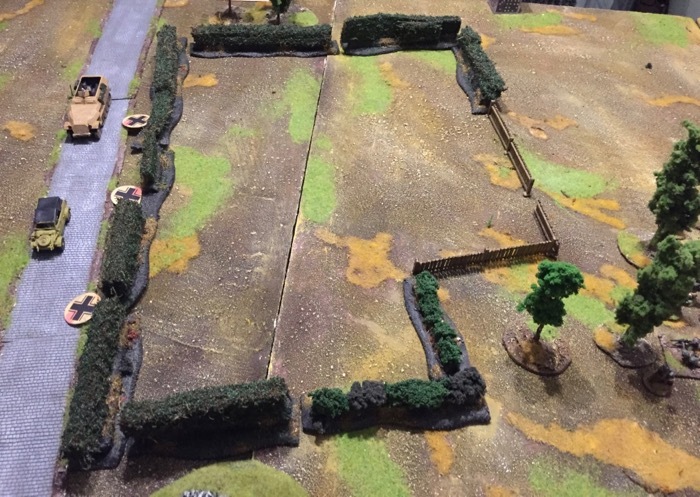 In game III, the Screaming Eagle will try to conquer a German bunker. But this time, things won’t be that easy. So stay tuned. And as always, happy wargaming!